Our client for this project decided it was time for a change in both her career and overall lifestyle. She tasked us with renovating the kitchen and bathroom in her NYC apartment to help her re-new a work/life balance. To encourage healthy eating, we designed a kitchen more conducive to cooking in order to motivate the client to prepare more meals at home. 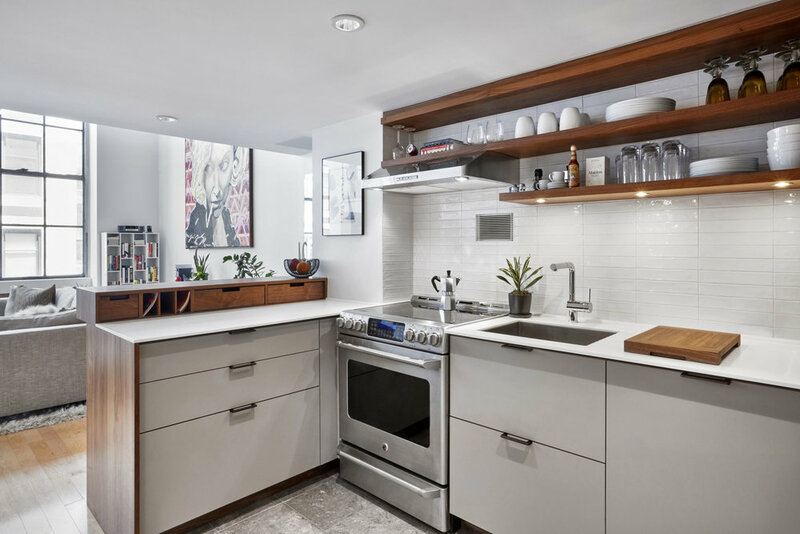 At just sixty-two square feet, the client needed an efficient use of space. 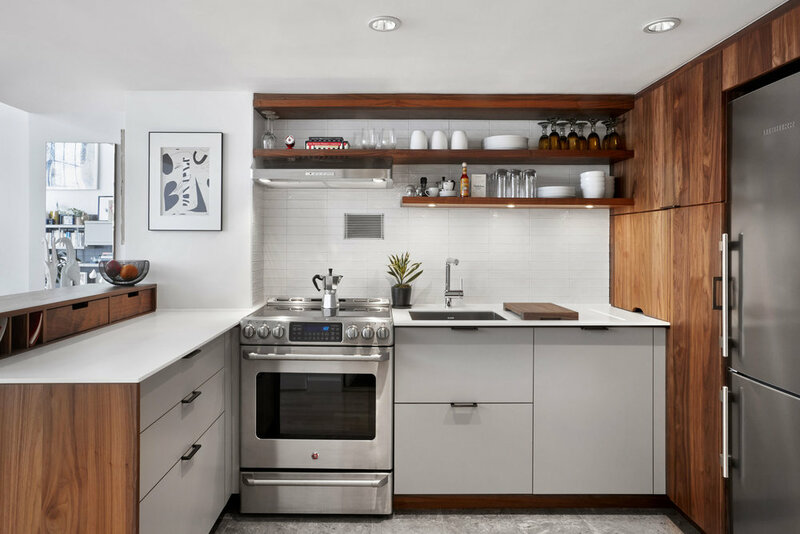 Open shelves and a neutral, linear backsplash help the space feel bigger while a tall pantry, including an enclosed cabinet for the microwave, increases storage space. 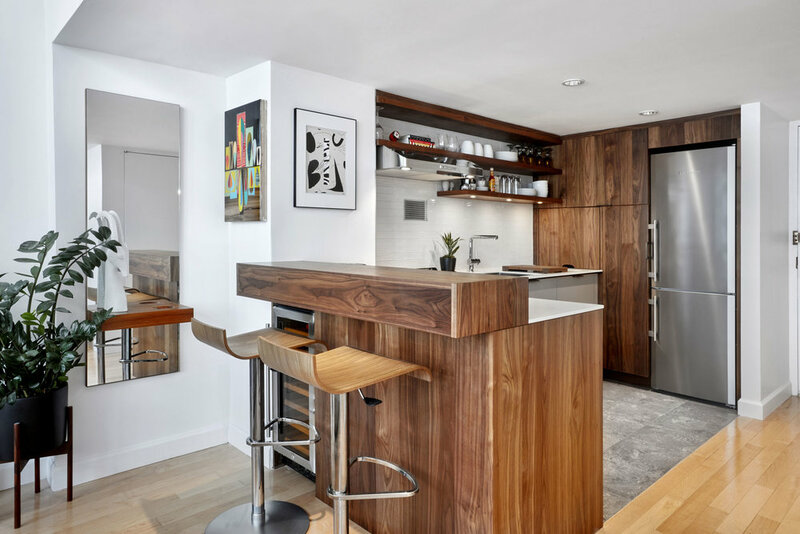 A peninsula wrapped in a walnut wood finish ties the kitchen to the living space and allows for conversation while cooking. The existing grey floor tile was buffed to give it a concrete-like finish, adding warmth to the space. To add character throughout the apartment, custom-designed molding was added to all the existing doors. This Victorian-era detail was a nod to the client’s love of Parisian design. The bathroom was re-designed to create a soothing and cozy environment to unwind at the end the day. 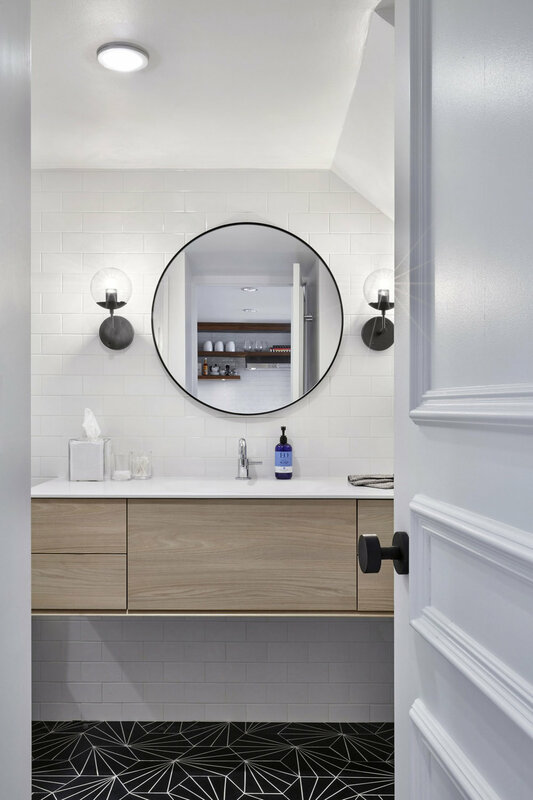 The soft lines of the hardware and organic shapes found in the mirror and wall sconces pair with simple subway tiled walls while black and white graphic concrete floor tiles add a bit of playfulness. The result of the renovation is a timeless design that is inviting and promotes a lifestyle change for many years to come.